Approximately 20 million Americans today suffer from some kind of kidney insufficiency that requires kidney disease care. Kidney diseases that can become chronic include kidney stones, urinary tract infections, or even chronic renal failure that could result in death. Patients who need extended care and rehabilitation after an acute renal episode requiring hospitalization can receive excellent, cost-effective care in community based nursing facilities – including dialysis if necessary. How are patients given kidney disease care including dialysis in community based skilled nursing facilities? 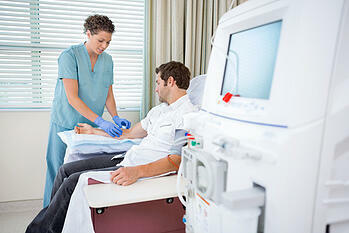 Many skilled nursing facilities now offer inpatient dialysis sessions on the premises. With this, patients are treated as home dialysis patients, meaning that they don't have to be provided care outside of the facility and can instead do it "at home." Also called subacute care, postacute recovery care is a comprehensive inpatient program designed for individuals who have had critical illness prior to kidney disease diagnosis or who have needed to be hospitalized as the disease has progressed or because of an exacerbation. While in the skilled nursing facility, patients recover strength and health until they're well enough to go home. Patients who have been diagnosed with kidney disease may first have a critical kidney or renal failure episode that requires hospital care. Once they're stable enough to leave the hospital but not well enough to go home, they may come to a skilled nursing facility to recover physical strength, to continue to receive kidney disease care, and to learn how to manage their disease. Renal patients who have already been diagnosed with kidney disease may also find themselves hospitalized on a regular basis just as a matter of course as the disease progresses. As with newly diagnosed patients, these patients must also undergo significant therapy to regain endurance and strength after a hospital stay. Once they're stable, they can be discharged from the hospital and transferred to a skilled nursing facility to postacute recovery care.